Witnesses have described the horrifying moment an Australian gunman opened fire in a New Zealand mosque, killing at least 30 people. The shooter, who identified himself on Twitter as 'Brenton Tarrant' from Grafton, New South Wales, stormed into Masjid Noor Mosque in Christchurch around 1.40pm local time, gunning down dozens while hundreds of worshipers took part in Friday prayer. 'The guy was wearing like an army [suit]. He had a big gun and lots of bullets. He came through and started shooting everyone in the mosque, everywhere,' Ahmad Al-Mahmoud told Stuff. 'They had to smash the door - the glass from the window and the door - to get everyone out. Al-Mahmoud said the man was 'wearing a helmet' and must have fired 'hundreds' of gunshots. 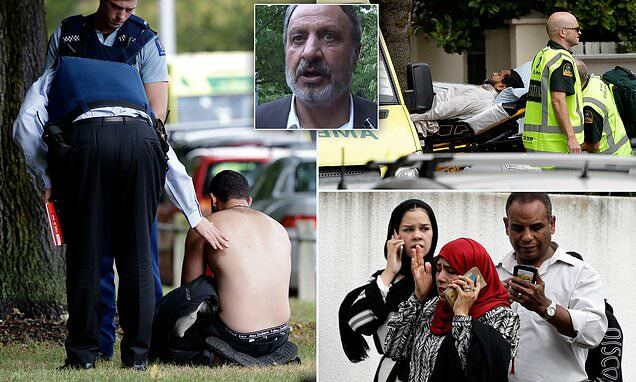 Another survivor, identified only as Nour, told the New Zealand Herald the gunman shot multiple worshipers outside before carrying out his rampage inside the mosque where he shot people indiscriminately. Nour said he was able to flee the carnage by jumping through a broken window. Police said four people are now in custody, including three men and one woman. One of them was arrested while wearing a suicide vest. In a livestream video, shot by the gunman himself, he is seen in his car wearing military-style body armour and a helmet saying 'let's get this party started'. In an 87-page manifesto he posted Twitter before the killings, he described the shooting as a 'terrorist attack'.